Prepare the Brownie Ripple Batter: Combine the butter and chocolate in a microwave-safe bowl. Microwave on HIGH until melted, about 1 minute. Stir until smooth and slightly cooled. Whisk in sugar and flour. Add the egg and vanilla and stir to form a loose batter. Set aside to cool slightly while making cake batter. Preheat oven to 350 F. Grease two 9x5-inch loaf pans. Set aside. Prepare the pumpkin batter: In a large bowl, whisk together the flour, baking powder, baking soda, salt, spices and white and brown sugars. In a medium bowl, mix together the oil and pumpkin. Add this mixture to the dry mixture and stir until combined. Add the eggs, one at a time, blending well after each addition. 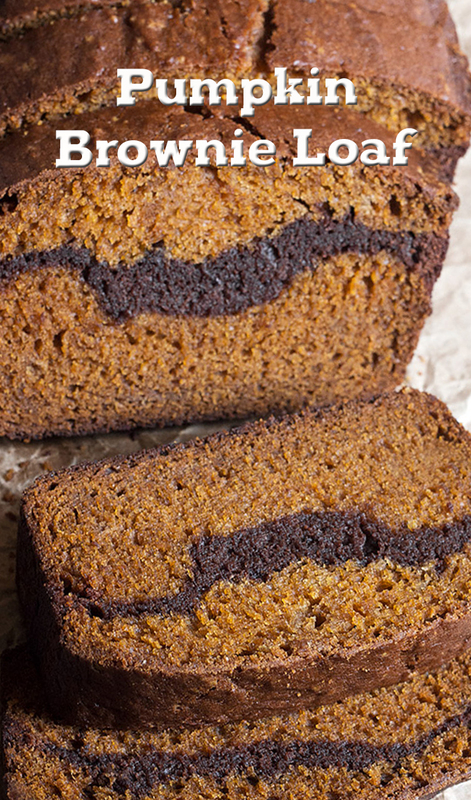 Add 1/4 of the Pumpkin Batter to the bottom of one of your prepared loaf pans. Level batter. Add 1/2 of the Brownie Batter and spread in to an even layer. Top with another quarter of the pumpkin batter and spread level. Repeat with the second loaf pan. Bake in preheated 350 F. oven for 50-60 minutes, or until a tester inserted in the middle comes out clean. Allow to cool for 5 minutes in the pan, then remove to a cooling rack to cool completely.